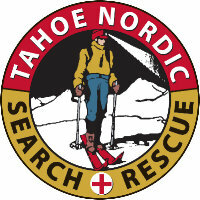 On March 3, 2019 thousands of skiers will participate in The GREAT Ski Race to raise money for the Tahoe Nordic Search and Rescue Team. Don’t miss the largest Nordic ski race west of the Mississippi on Sunday, March 3rd starting at 9 am. The Great Ski Race is the main fund raising event for the Tahoe Nordic Search & Rescue Team (Team), a non-profit all-volunteer organization. Race proceeds are used primarily to purchase equipment for the Team, and to support winter survival and avalanche education programs sponsored and conducted by the Team. On Sunday, March 3, between 500 and 900 skiers will skate, stride and snowshoe across 30 kilometers (18.43 miles) of groomed mountain snow trails from Tahoe City to Truckee in one of the longest, most eccentric cross-country ski races in the West. The race course famously traces a historic stagecoach postal route through the forest east of the Truckee River and beneath Mt. 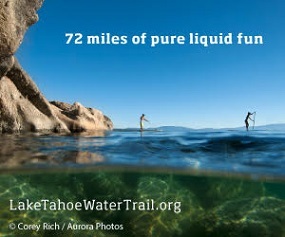 Watson north of Tahoe City. Some participants train all year to compete, oftentimes joining training groups and seminars to hone their skinny ski technique; others just get up and go after squeezing on their Nordic boots for the first time in the season. The race course covers magnificent terrain and offers spectacular views of Lake Tahoe and the Sierra Nevada. How does registration work? While you can register the day of the race, it’s highly recommended that you register in advance. Then, on the Friday (12:00 PM – 5:00 PM) and Saturday (9:00 AM – 5:00 PM) before the race, and Sunday (race day) up until 8:30 AM, you can pick up your pre-race package at the Tahoe Cross Country ski area. What competitive categories are available for the race? Despite a few requests for Classic or Snowshoe categories, TGSR is still considered a skate race, and the categories are broken down by gender (M/F) and age (10 year increments). Do I have to cross country ski the course? 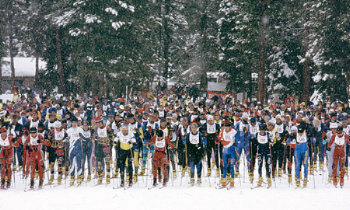 You can run or walk the course, but snowshoes are required (skis are highly recommended, however – this is a ski race!). Is the entire race course groomed? Yes; the race course is machine-groomed with skating lanes and double tracks the entire 30 kilometers (~18.43 miles). Please make sure to respect the striders tracks if you are skating. Will there be a wave start? Yes! The start field will be divided into 6 wave starts. Skiers will be seeded based on past performance in TGSR. If you did not compete in TGSR since 2002 you should submit a race resume in order to be seeded in the appropriate wave. What kind of shape should I be in for such a race? The fastest time is 1:07, and the slowest is around 7 hours. This race is a test of endurance and skill; be sure you are in good shape so you can enjoy the course. Due to the length (30 kilometers, ~18.43 miles) and remoteness of the course beginners are not advised to enter; but skiers of all abilities and ages do enter this fun and challenging race. Where can I go to get some practice cross country skiing in? The week before the race the Tahoe Cross Country ski area is offering a special pre-race trail fee for pre-registered Great Ski racers. Ski for only $10 a day during race week.